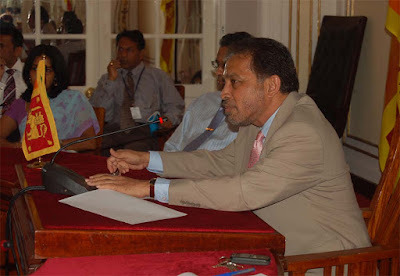 (January 12, Colombo, Sri Lank Guardian)This meeting has been convened for us to reflect on current developments in Sri Lanka, especially those relating to the efforts of the security forces to re-occupy the entirety of the territory which has been controlled by the LTTE. You all heard the statement of H.E. the President on Friday. As we all know, the security forces have been pushing relentlessly into the Wanni and last week, there was a successful link-up at Elephant Pass between the forces stationed in Jaffna and those advancing from the South. This was a historic event as the North-South road, the famous A-9, and the railway line was brought under the control of the Government after a lapse of many years. While the victory on the battlefield gives us comfort and reassures us of the future direction of the country, we must also be aware of the challenges that will confront us, particularly from the perspective of this Ministry. We have continually reassured the international community that our goal is not simply a military victory. Our key objective is to re-establish democracy and democratic governance throughout the country. We have paid a heavy price to realize this objective, both in valuable lives and resources. This will pose a difficult challenge, given the absence of adequate infrastructure in the Wanni and also the absence of an awareness of proper democratic governance. It will be a difficult task to introduce to the Wanni what we in the rest of the country take for granted; free elections, democratic governance, freedom of choice, etc. However, we must meet this challenge as we did in the Eastern Province. The Eastern Province has provided a useful and successful model for us. It is also our duty, consistent with the commitment made by the Government, to ensure that economic opportunities are quickly spread to those areas of the country which up to now, have been controlled by the LTTE. Electricity will have to be re-connected, roads will have to be rehabilitated, irrigation works and agriculture restored, in general commercial activity re-introduced to an area which has been controlled by an iron fist and cold steel for many years. In this task, we will need to secure the assistance of friendly countries and international organizations. Children must be provided the environment to study in peace and grow up to be useful adults in their communities, instead of wasting their youth in military training, only to be sacrificed at the altar of bitter conflict. Importantly, we will also be confronted with the challenge of restoring a society which had been blighted by continuous conflict. Families have lost members, they have been separated and many have been displaced. A major social rehabilitation and reconstruction programme will also have to be launched. The displaced will have to be returned to their homes as we so effectively did in the East. Again, in this task, we will need to seek assistance of friendly governments and international organizations. The LTTE can be expected to intensify its efforts overseas, exploiting the diaspora. They will, like other groups of their nature, raise funds, mobilize martyrs and continue to denigrate Sri Lanka. We will need to continue our efforts to counter the LTTE in their overseas bases with the help of all our friends, particularly Sri Lankans who have so selflessly championed the cause of the country, some at great cost to themselves.